John Bentley was a big, fast and aggressive wing who played four times for England between 1988 - 1999. Inbetween he switched codes and played international rugby league for Great Britain while representing Leeds, Halifax and a short stint with Balmain in Australia. After rugby union turned professional he reverted back to it- a code in which he had made his international debut against Ireland in 1988 - and signed for the Newcastle Falcons. 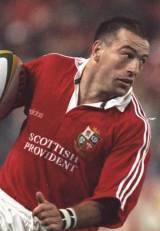 He was selected for the 1997 Lions tour of South Africa where he played in the winning second test opposite James Small who refused to shake his hand after the game following some heated exchanges between the two and allegations of gouging from the South African following a tour match. Bentley was one of the most important personalities on tour, and his stint with the Lions brought him more acclaim than anything he achieved with England. His final two performances for England came against Australia and a 29-11 defeat by South Africa was his last before he retired from union and switched allegiances back to league.